Marie Antoinette famously did not say: “Let them eat cake!” on the eve of the French revolution, although it has been attributed to her as evidence that she failed to appreciate the plight of starving French peasants. Somehow I have been reminded of this callous and ignorant phrase upon hearing of a new PR offensive by the coal industry to “eliminate energy poverty”. In light of yet more dire predictions from the Intergovernmental Panel on Climate Change (IPCC) about the scale of disaster climate change is expected to wreak on the world’s poorest people, it is shocking, yet not surprising that the worlds largest coal firm (Peabody) has hired the world’s largest PR firm (Burson-Marsteller) to launch a campaign called “Affordable Energy for Life”. I would like to say that this is nothing more than a cynical move to resist the tide turning against coal. But in fact, the tide is not turning against coal. According to the International Energy Agency, coal is set to overtake oil as the number source of energy worldwide. This is for two reasons. Firstly, coal is abundant and cheap. 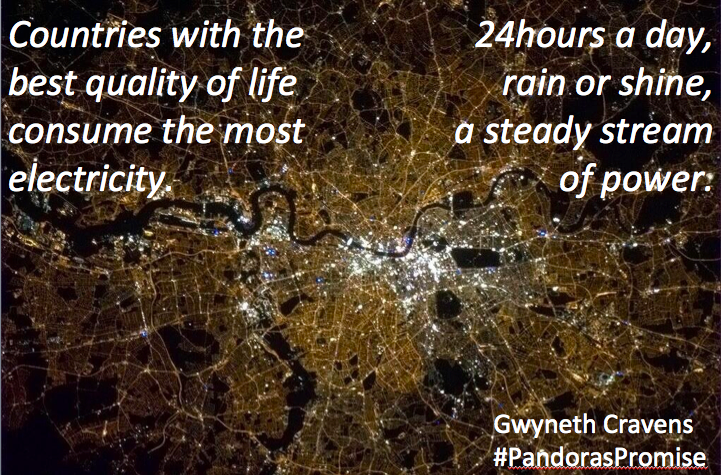 Secondly, half the world’s population does not have access to electricity. Most of the growth in electricity generation is driven by coal. Indeed, as Ed Crooks reported in the FT this week, Exxon Mobil expects fossil fuels to be around 75% of global energy in 2040, and while this appears to be consistent with the IEA forecasts, it is not consistent with the staying within the 2degrees of warming target. We shouldn’t turn our noses up. Old King Coal has served us well. The economics of coal drove the industrial revolution in the west, just as is now happening in China and elsewhere. Unlike previous sources of energy the effort expended in mining and burning coal results in a much greater output of energy released. The progress, prosperity and quality of life many of us enjoy today are thanks to, and still largely powered by, coal. (In the UK, coal contributes up to 40% of our electricity mix). However, electricity from burning coal comes with a heavy price. Burning coal generates carbon emissions as well as hazardous pollutants such as mercury, lead, and benzene. The latest IPCC report warns that “the worst is yet to come” with severe climate impacts that will hit the poorest hardest. The BBC reported last week that one in eight global deaths were linked with air pollution, making it “the world’s largest single environmental health risk“, according to the World Health Organisation. Air pollution caused 7 million deaths worldwide in 2012 alone. Reducing indoor air pollution by increasing access to electricity is synonymous with prosperity and public good. But electricity generation from coal comes with a long-term payback. China is good example of the short-term gain in exchange for long-term pain. Rapid growth in coal-fired power stations has given millions of people access to electricity, thereby raising their quality of life, and reducing indoor air pollution. However, the net result is that the air pollution (and associated climate and health risks) has been pushed outdoors into the local environment and wider atmosphere, the smog ultimately causing permanent and lasting damage for millions of people. The question is this. How can we best respond to the twin challenges for our time: climate change, caused by energy consumption, and poverty, caused by lack of access to energy? Until we recognize that these challenges are mutually dependent, we will never win the battle for hearts and minds. Having run PR campaigns for a catalogue of world-class villains, from the tobacco industry to Union Carbide after the Bhopal disaster, Burson-Marsteller have the perfect track record to push dirty coal to the world’s poorest people. Right now, climate campaigners are pushing solutions (renewables and efficiency) that cannot compete with coal in terms of cost or performance compared to fossil fuels. In the battle between climate and coal, coal is winning because it promises prosperity. Climate campaigners need a new narrative that recognises the rights of half the world to access the electricity we take for granted, whilst being realistic about what it will take to replace the world’s existing fossil fuel infrastructure…and then double it. First published on Business Green. Just had word of new findings on Fukushima health effects out today from UNSCEAR (United Nations Scientific Committee on the Effects of Atomic Radiation). “People are rightly concerned about the impact on their health and their children’s health,” said Carl-Magnus Larsson, Chair, UNSCEAR. “Based on this assessment, however, the Committee does not expect significant changes in future cancer statistics that could be attributed to radiation exposure from the accident,” he said. For marine ecosystems, the possibility of effects on flora and fauna was limited to the shoreline area adjacent to the power station, and the potential for effects over the long term was considered insignificant. Personally, I wish Greenpeace, the Guardian and others who have spent considerable time raising the alarm over Fukushima would also point to these reassuring findings, and secondly recognise that in this case, spreading fear is much more harmful than radiation. The press release is here. Thanks to @jeremyWNA for the heads up. What will it take to decarbonise the UK? Just what volume of energy generation will it take to decarbonise the UK? One of my favourite, jaw-dropping pieces of analysis on this is by the Royal Academy of Engineering, who published a report Generating the Future (2010) setting out just how much new low carbon electricity generation would be required for the UK to meet its legally binding climate targets to cut carbon by 80% by 2050. The results are staggering. The shopping list includes: 38 London Array wind farms, 10,000 2.5MW onshore wind farms, the Severn Barrage, 25GW of biomass, oh, and 40 new nuclear power plants. It is possible to achieve a non-nuclear scenario, for example, using the DECC energy pathfinder: http://my2050.decc.gov.uk/ but this requires significant compromises, in terms of environmental impact (cover 75% of land in energy crops, anyone?) cost, economic competitiveness, lifestyle changes, or environmental impact, which may not be acceptable to the public. 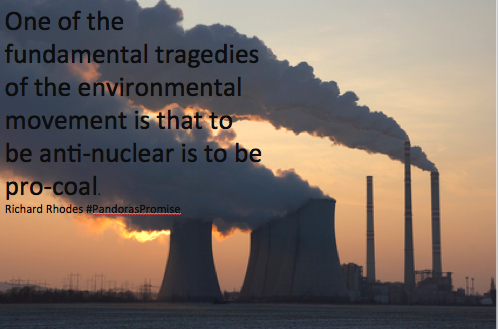 As Mark Lynas details in his e-book Nuclear 2.0 Why Nuclear a Green Future Needs Nuclear Power, environmentalists are increasingly realising nuclear is essential. 7 ways to make nuclear cheaper (than it already is). Why do the costs of building nuclear appear to be rising over time, instead of coming down, as you would expect from other technologies? One of the biggest challenges we face in making the case for low carbon nuclear energy is “the economics don’t stack up”. 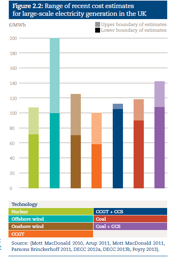 Well-regarded analysis on behalf by the Committee for Climate Change, and helpfully aggregated in this graph below, by the UKERC, demonstrates that nuclear is among the most cost-competitive of all low carbon technologies (similar to the best estimates for on-shore wind). Yet the economics of nuclear remain very challenging. UKERC: Presenting the Future: An assessment of future costs estimation methodologies in the electricity generation sector. Inspired by Buzzfeed, here’s your guide to why the costs of building nuclear appear to be rising over time, instead of coming down, as we expect from other technologies. Enjoy! Commodity prices (meaning steel and concrete, for example) tend to be rising. Not much can be done about this, but it’s worth noting that volatile commodity prices drive up costs for all kinds of infrastructure. Design and regulatory approvals not completed before manufacturing and construction starts causes rework and delays. In the UK, the new Generic Design Assessment process is intended to iron out any regulatory wrinkles in the reactor design long before construction starts. The Office for Nuclear Regulation has now given the green light to the EPR reactor for Hinkley Point C, after four years of review, amendments and consultation. The proof will be in the pudding, but it is expected that this will result in far fewer delays or re-work during construction. So-called “nth of a kind” (NOAK) – as opposed to “first of a kind” (FOAK) – cost reductions are possible but can be offset by delays between projects. Also, changes in design, regulations, management, personnel, financing etc. that are allowed to happen or are required by regulator or investors can eliminate potential NOAK savings. NOAK reductions are achieved where management/government regimes are strong and do not allow changes or effectively incentivise NOAK reductions. China and South Korea are good examples. Nuclear energy is vulnerable to “cost shocks” when an accident happens, as with Three Mile Island and most recently Fukushima. For example, UKERC cite the rating agency Moody’s who estimated the Fukushima accident will likely result in a range of higher costs as a result of increased scrutiny, more stringent safety procedures and longer maintenance outages. Risk finance can be high and very variable from country to country dependent on finance package and where ultimate risk lies. The Coalition Government’s “no subsidy” commitment means the UK is particularly prone to risk finance because of our private-sector funding policy. Financing any major new infrastructure through the private sector is challenging, but to achieve this for nuclear will be heroic. With such a large project with a long construction lead-time, and 60+ years of operational life, the upfront cost of capital is enormous. Added to this, the political risk associated with nuclear projects (which need a public confidence licence to operate), it is no wonder that financing is expensive. It’s worth saying of course that herein lies the logic of Electricity Market Reform: left to its own devices, the market will build gas, since it’s cheap to build and the risk lies in the fuel price volatility, which can readily be passed on to the consumer. All low carbon electricity generation technology shares the same challenge of high upfront capital costs that presents a risk to the investor, whilst low operating costs offer a benefit to the consumer. Building up skills and supply chain to maximise UK content and drive down costs takes time. The Nuclear Industrial Strategy, which the Government published last year, outlines the potential economic, skills and industrial opportunities associated with a new build programme. Around 32,000 new jobs could be created during the current planned 16GW programme. By strengthening the UK industrial base in this sector the global market potential (anticipated to worth up £1trillion over the next 15 years) is hugely promising. I would be interested to know if others have views on this list, either comments or additions. But before I go, one thing you may have noticed that is NOT on the list: Waste. You may have noticed that the costs of managing and disposing of waste are not included as a significant feature determining the economics of nuclear. This is because decommissioning costs for nuclear power plants, including disposal of associated wastes, are reducing and contribute only a small fraction of the total cost of electricity generation. In most countries new build operators will be legally required to save an independently verified set amount of money throughout the operation of the plant, which will pay the costs of decommissioning, managing and disposing of the waste. In the UK, this cost will be included in the strike price agreed through the contract for difference, but over the lifetime of the plant, does not represent a significant financial burden. The independent board established to monitor, review and scrutinise this Funded Decommissioning Programme is called the Nuclear Liabilities Finance Assurance Board, chaired by Lady Balfour. Meanwhile, the lion’s share of the huge budget (from DECC to the Nuclear Decommissioning Authority) associated with nuclear decommissioning in the UK is spent on cleaning up military facilities dating back to the Cold War. These costs are not representative of decommissioning costs for modern civil nuclear plants, which are designed to be cleaned-up after the end of their operating life. So we know why costs are rising. If we are serious about tackling climate change, the next challenge is how to bring costs down. There are plenty of people puzzling over this. Here’s a great contribution that I would recommend, from the Breakthrough Institute, How to Make Nuclear Cheap. On the eve of the publication of the latest IPCC report on the anticipated impacts of climate change, the Guardian has published an interview with one of the godfathers of the environmental movement, James Lovelock. I believe he is unfortunately right. Every single one of the mainstream environmental NGOs stick to the orthodoxy that it is possible to replace our global fossil fuel system entirely with renewables. The writing is on the wall. While we are all in favour of clean renewable energy, it is pure zealousness that suggests we can replace fossil fuels, and meet rising global demand, with current technologies. When not one single environmental NGO can bring themselves to do the maths, and countenance the only low carbon technology that can be scaled up sufficently to replace base load power from coal and gas, they are failing all of us. This obstinate refusal to face up to the facts arguably fuels climate skepticism. If environmentalists do not care enough about climate change to change their minds about nuclear energy, why should anyone take them seriously? Sadly, the dogmatic anti-nuclear stance of mainstream greens ends up being by default, pro-coal.